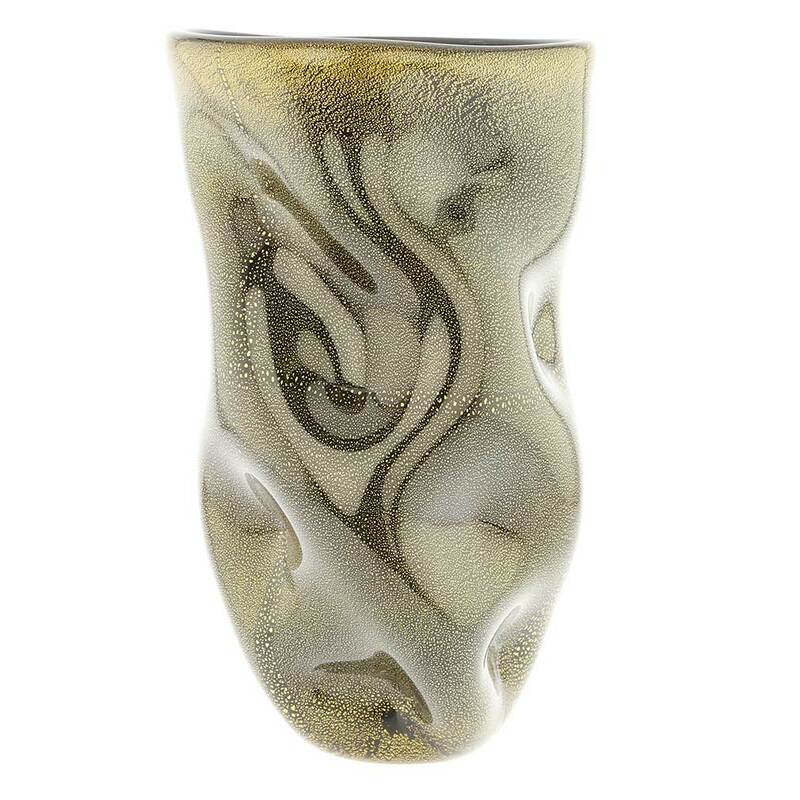 The fluid form and classic rich black color of this Murano Glass Vase play off the shimmering gold leaf infused in the glass, making this vase an instant attention-grabber in any room of your house. 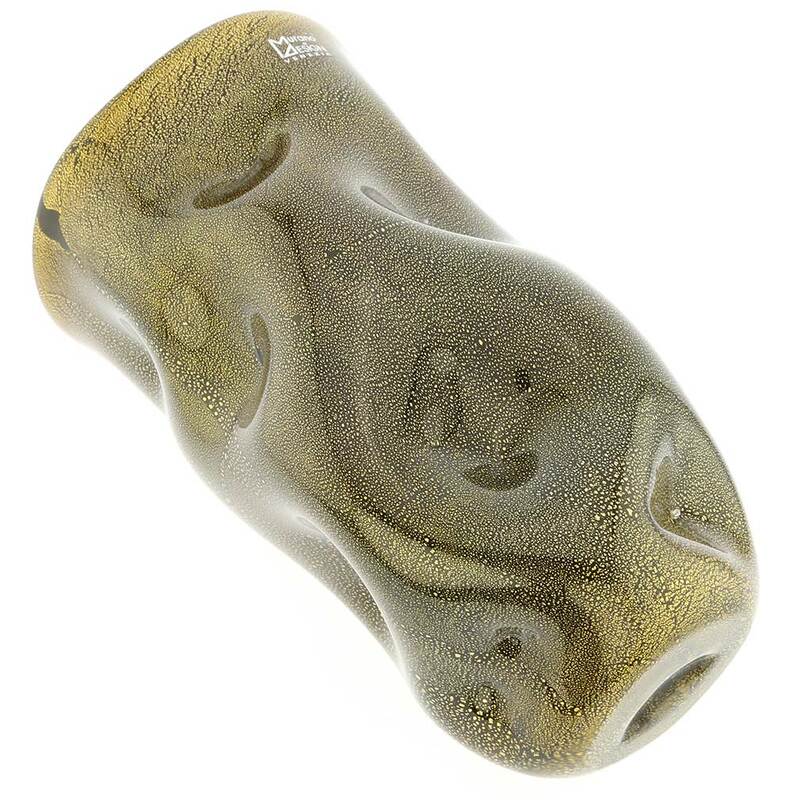 A unique material, glass starts out as a thick liquid that is shaped by hand and then solidified, allowing for incredible forms that seem to be moving, almost flowing, rather than stale and lifeless. Ancient Murano Glass tradition, finest raw materials from the Venetian Lagoon, and the exceptional skill of Murano Island's best glass artists and artisans are all parts of the recipe for the enduring global fame of Murano Glass. 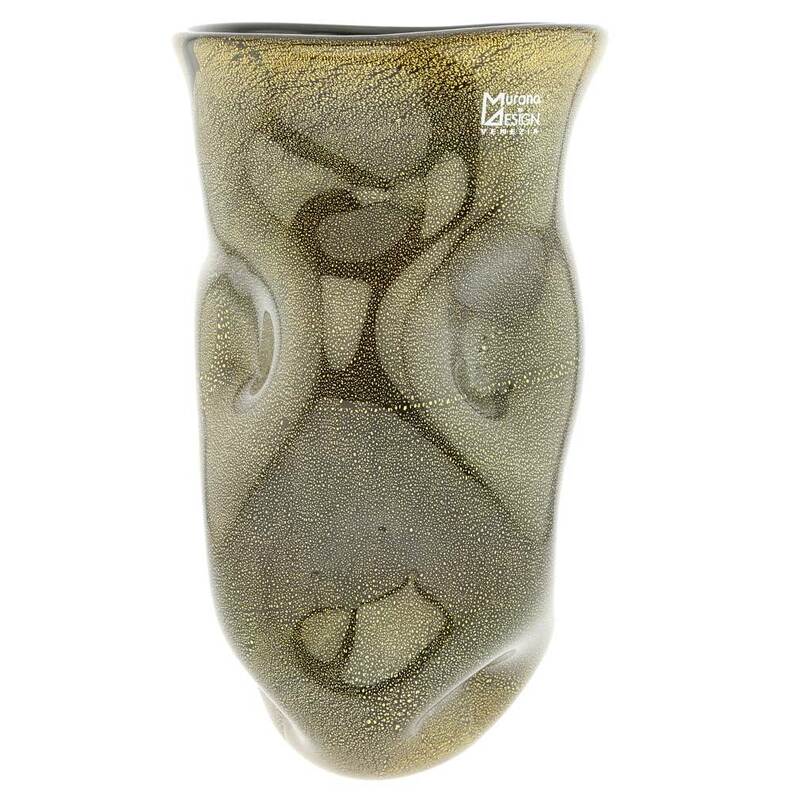 This Murano vase showcases the skill, passion, and imagination of the glass artists, who use complex centuries-old techniques while infusing contemporary influences into their creations to make decorative glassware of rare beauty and artistic value. 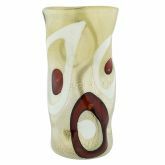 This Murano Glass vase is a fine designer accent for your home and an amazing Venice-inspired gift for special occasions such as birthdays, weddings, anniversaries, or career milestones. 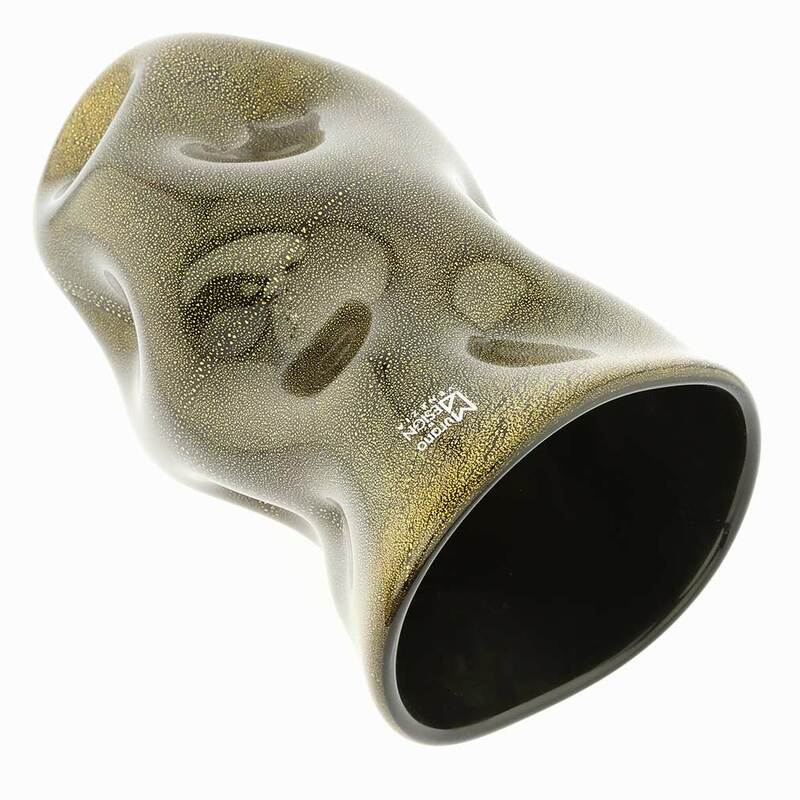 Measurements: This vase measures approximately 11 inches in height and 6 inches in diameter at the top. The base is about 4 inches in diameter. The vase is very well packaged to avoid damage in transit. It features the artist's signature on the bottom, the original sticker, and comes with the certificate of authenticity. 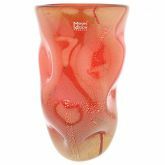 As each Murano Glass piece is unique work of art made entirely by hand, some variations of colors, patterns, and shapes, as well as random bubbles inside glass are possible and do not constitute a defect. Gold Foil or Gold Leaf is used in Murano Glass to create designs that seem to shimmer and glow, which is achieved by infusing very thin pieces of real 24 karat gold foil into the liquid glass. This technique is used in crafting Murano glassware ranging from small beads to large sculptures and vases. In larger pieces, the Venetian glass artisan gathers a big blob of glass at the end of a metal stick, then wraps gold foil around the blob, creating a thin outer layer of pure gold, and then puts the blob into the furnace to ensure that the gold permanently fuses with the glass. In this way masters in Murano Glass factories can create gold Millefiori or Sommerso glassware, adding a touch of pure sunshine to art glass.